I remember returning home after my first trip to Thailand, and looking at an atlas to pick out the places I had been. Thinking I had been all over the country, I was a little disappointed to see that, in fact, the places I had visited were all within rather close proximity to Bangkok – Ayutthaya, Lopburi, Suphanburi, Kanchanaburi, Singburi and Koh Samet. That trip seemed to somewhat set the tone for my return visits – perhaps unsurprisingly, given I had met a Thai guy in my first week and was then seeing him for the two years that followed, my subsequent trips took me largely to his home region of the central plains. Apart from a brief long-weekend flirt with the northern cultural capital of Chiang Mai, I barely stepped out of that central area – one which, interestingly, usually barely figures on tourist itineraries; because, in all honesty, there is very little to do there of any real interest. And so it came to be that, by the time I arrived out here for this sixth trip, I still hadn’t ventured to the south. Indeed I had made no plans to visit the south on this trip, even – it was only by chance that, after meeting a new friend of a friend who works for a company that runs tours similar to the one I took two years ago (it’s a long story! 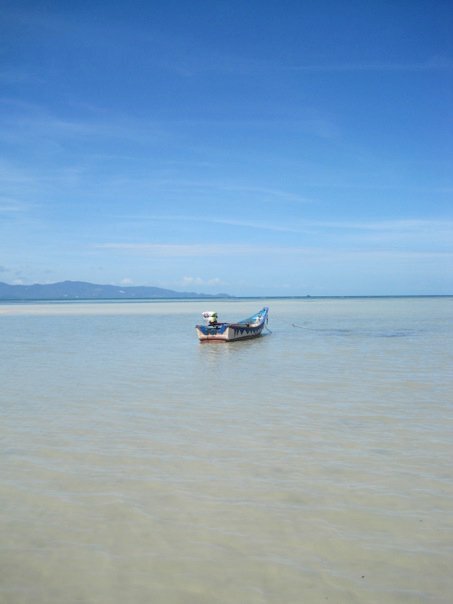 ), I ended up taking the spare seats on the bus-and-boat trip down to Koh Pha Ngan on the Gulf coast. First impressions weren’t great. I am not a fan of overdone westernisation (hence my affair with the less touristed central provinces, and my fondness for equally untouristed places like Sangkhlaburi), and the ride from Thongsala pier along to Ban Tai bay made me unreasonably upset – for no reason other than that the shop windows along the way were lacking the obligatory Thai writing, that just should, by default, be there. After time spent in places where little English is often spoken, and where what little nuggets of Thai you might happen to know serve a real purpose beyond being a novelty for farang-wowed locals, seeing only English can come as a shock – and it certainly isn’t what I come to Thailand for. The other issue for me is that English-only signs are often indicative of areas where the locals have become slowly jaded and tourist-fatigued over the years. In Pha Ngan, the signs very often tell the true story. But looking beyond its obvious flaws, Pha Ngan is a beautiful island – and one where, if you pick the right spot, you really can have your own slice of island paradise. Waking up in a bungalow whose door opens onto sand literally feet from the waves is an idyllic bliss hard beaten. Pha Ngan adds to this the hedonistic thrill of Haad Rin and its surrounds, and between them their array of loosely lunar cycle related parties. But by sticking to the sand you can quite easily make this island whatever you want – fire-breathing boozathon, secluded, romantic getaway or more family-oriented, activity-packed sun-seeking holiday. Watersports, boxing, yoga – if you need something to keep you busy, they’re also all quietly available – not in your face away from Haad Rin, but most definitely there. And through all of this, Pha Ngan still hangs on to a most definitely laid-back attitude, with shabby bungalows fringing the sea shore in resorts which qualify to be described as either charming or neglected, depending on your perspective. The original full moon parties may have since been over-commercialised but, beneath that, the place still has the same outlook – and so appeal – that first kicked them off all those moons ago. A leading guide book to Thailand rather amusingly pins the survival of this atmosphere on the island’s lousy road system and so general infrastructure which, it probably quite rightly says, has proved an impediment to developers, who have had a good stab at wrecking beautiful natural havens elsewhere. Whatever the reason, it’s true that in spite of all the hazy drunkenness, there is something just ever so slightly different about Koh Pha Ngan. I can’t quite settle still on whether I prefer Samet or Pha Ngan. The secluded shores of the south-west coast afford idyllic quiet, but I miss the squeaky white sand and low-key beach bars and restaurants of Samet. I’m back here with the family now, though, on my second visit, and their emotive reaction to the beachfront location just reaffirms once more that this is somewhere very special.